As Johnny Cash said many times, "Love is a burning thing and it makes a fiery ring." 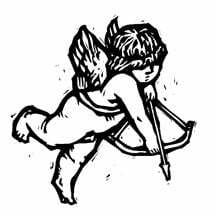 That’s the way a Valentine’s Day-themed column I wrote back in 1995 began, when times were simpler and I was 31-year-old whippersnapper with a semi-bright future instead of a 54-year-old journalist with a checkered past and no desire to write a fresh column this week. So why not recycle that old one? It still works about as good as it did back then so here is the rest of it with a minor adjustment or two. If that fiery ring statement was autobiographical, Johnny should have seen a doctor about his uncomfortable condition. Or it could be that The Man in Black was speaking metaphorically, suggesting that love is as powerful as the chemical reaction that produces light and heat. There's a reason for this mushy love talk in a space usually devoted to subjects like my unnatural fixation on monkeys or my inability to successfully hammer a nail. If you haven't gotten your sweetheart a card or candy or hunk of semi-expensive jewelry by now, you're out of luck. Or, I should say, WE'RE out of luck because I let the holiday slip up on me, too, mistakenly thinking that Feb. 14 was Groundhog Day. When I realized my mistake, I took a trip to one of our local discount stores and discovered that the quicker acting romantically inclined gentlemen had beaten me to the good stuff. Only a few cards remained and they bore inscriptions like "To My Darling -- I Will Love You Forever. Please Have The Restraining Order Lifted." Most of the jewelry still available was out of my price range, except for a "Teen-Age Mutant Ninja Turtles" wristwatch marked down to half price. The candy supply had dwindled, too. I decided against the chocolate-covered cough drops remaining on the shelf. At this late hour, I must to opt for the Romantic Note, the heartfelt message left for the sweetheart to discover, read, sigh, swoon and exclaim, "Oh, what wonderful, caring individual this person is." You, too, can take advantage of the Romantic Note. Just cut this next part out, fill in the blanks with your sweetheart's name and stick it to the refrigerator with any available magnet. Maybe it will keep you getting burned by the ring of fire or kicked in your surfer's knobs. While others give their lovers diamonds and pearls, I offer to you on this special day my words of love, something that money can't buy no matter how many discount stores one goes to. You, (insert name here), are my reason for living, my everything, my hot and spicy chicken wing, my ticket to The Final Four, etc., etc. I spent countless hours searching for the perfect gift this Valentine's Day, but no mere card nor box of candy nor cartoon wristwatch can express my love for you, (insert name here). I think Johnny Cash said it best: Life ain't easy for a boy named Sue. That wasn't the line I was searching for, but I always thought that song was funny. Love, (insert your name here)"